Over the last few weeks at the Hixon home we witnessed the arrival and the departure of plum season. It's a pretty exciting time of year, for me, when I can just walk into the backyard and acquire free, delicious food. It's also an exciting time of year for the squirrels. And this year plum season got me thinking about the Bible. You see, the scriptures were written for people who knew about agriculture and husbandry first hand. Unfortunately, for most of us reading the Bible in the US today, all of that work happens out of sight, without ever intersecting our lives (except as fresh veggies, sticks of butter, and packages of bacon at the store), and so we don't always hear all the resonances of the images and metaphors that the Bible is using. Paul talks about the "fruit of the Spirit" (Gal 5:22-23), and I know a lot about eating fruit, but I don't know so much about growing fruit, which is the whole point of the image. This is fruit that the Holy Spirit plans to 'cultivate' inside of me. But the image doesn't mean as much to me as it could, because growing fruit isn't a part of my life. There's a lot of waiting, but then, suddenly, you may find all kinds of fruit. After you notice the first buds and flowers on the plum tree, there are months of waiting when it seems like nothing is happening. Maybe there are some baby plums on the branches, but they aren't good for anything. Until, it seems like overnight, they ripen and you have more fruit than you know what to do with. But growing fruit isn't quick. And that's also true of the fruit of the Spirit. The Holy Spirit works in us with the patience of a farmer. Love, joy, peace, and all the other virtues God would cultivate in our hearts develop over time, sometimes very slowly. Eventually, though, maybe without you even realizing what's been happening, you may find yourself radically transformed by God's Spirit, with all kinds of fruit. You may suddenly find that God's been nurturing within you compassion, generosity, patience, or self-control that you've never known before. One day that fruit is going to be ripe for the picking. Fruit is meant for sharing. I was reminded this year that you simply can't keep all these plums to yourself - the tree is just too fruitful, the yield's just too abundant - you have to share! The fruit on our tree wasn't meant for one person (or even one household). It's meant to be spread around and to bless others too. And of course that's also true when it comes to the spiritual fruit in our lives. God does care about our hearts and minds, and God wants to make us new and whole for our own sakes. But God also wants us to make us a blessing for others. Remember what the Lord told Abraham: "I will bless you and make your name great, so that you will be a blessing... in you all the families of the earth shall be blessed" (Gen 12:2-3). If the Holy Spirit has raised up joy in your heart, or kindness or love, how are you using that fruit to "be a blessing"? Have you looked for someone to share it with, someone who could use a fresh encounter with God's grace in their lives? Well God's grace is active in you, growing that fruit - so go be the blessing they need! It's so easy to waste your fruit. The ground around our tree is covered with rotten and split and smashed plums, like the day after some grisly plum warfare. And even if you pick as many as you possibly can, if you don't have a plan it won't be long before so much of the fruit has gone to waste - in a bowl waiting to be eaten or to be turned into jelly. It feels awful to watch all that fruit spoil, thinking about all the things you could have done with it. Don't waste your fruit. That's not why God gave it to you. The Lord has a purpose for it. Try to discern how God wants to use you and the person you're becoming. Is there a need in your church, in your community, in your marriage–is there some need around you that God might be preparing you to meet? Don't wait until the opportunity is wasted and all you can do is look back with regret. Use the fruit you've got while you can. Don't let God's timing pass you by. Jesus said that "My Father is glorified by this, that you bear much fruit and become my disciples." (John 15:8) Disciples of Jesus Christ are fruit-bearing people. "I appointed you to go and bear fruit, fruit that will last" (15:16). Where has he appointed for you to go? What fruit has the Spirit been cultivating in your life? It's there to bless you, and to make you a blessing. So spend some time praying and wondering today: what is God trying to do with me? Where can I go, who can I go to, to bear some "fruit that will last"? Last week the world couldn't stop talking about the death of Harambe the gorilla. 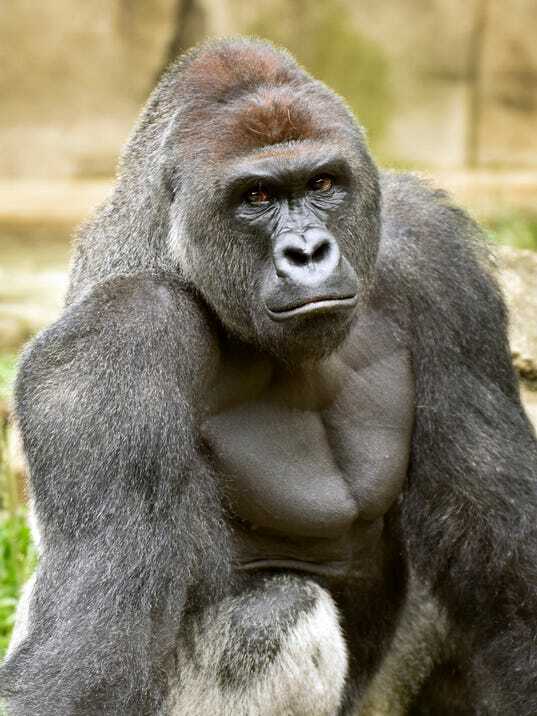 As you probably know, Harambe was a 17-year old western lowland gorilla (a critically endangered species) living in the Cincinnati Zoo, until a week and a half ago when a young boy fell into the gorilla enclosure, was seized and dragged around by Harambe, and the gorilla was shot to rescue the boy. It seemed like the news coverage would never end. Maybe there wasn't much else happening last week; maybe it's because the story touched on both people's deep love of animals and deep concern for children; or maybe it just provided a convenient fault line for more partisan bickering (one side disgusted, saying, 'how could this have happened? ', the other disgusted, saying, 'why are you so upset about this?'). Whatever the reason, the news just wouldn't quit. Now, I love animals. I love zoos. But I especially love primates. On those rare occasions that I get to see a gorilla or a chimp or an orangutan, my heart soars. I'm lost in wonder like a small child. The fact that the western lowland gorilla's scientific name is Gorilla gorilla gorilla lights up my world. I just freaking love them. And so when the news first broke that a gorilla in Cincinnati was shot, I didn't even want to know what it was about. My wife didn't mention it to me when she heard, because she knows how I feel about monkeys (I know, I know - a gorilla is an ape, not a monkey). That being said, I'm also someone who tends to listen to the experts (especially in fields about which I know next to nothing). So when Jack Hanna came out and said that he agreed with the decision to shoot Harambe "1,000%", that about settled it for me. Jack Hanna loves animals too, and Jack Hanna knows his stuff, so I believe him. I know some people will disagree, and of course it's all hypothetical, but I'm going to accept that it was necessary to ensure the boy's safety. I hate it, though. It breaks my heart. All of this makes me think my Old Testament professor, Stephen Chapman, was right when we were reading about Behemoth and Leviathan in Job (see especially 41:1-9), and he said that "They're not for you... and that may be what's wrong with a zoo." Maybe some wild animals weren't made for our pleasure but for God's and for their own (like in Ps 104:25-26). This is a picture of the hope in store for God's people and all of our fellow-creatures too. According to Isaiah (also see 65:17-25), the salvation that God is bringing to the world is going to touch humans and animals alike. It's going to bring peace to the whole world: peace between the animals (wolves and lambs don't usually live together), and peace between humans and animals. And the prophet specifically describes the harmony between animals and children. "A little child shall lead them..." (11:6) In this vision, children are safe playing over an asp's hole, sticking their hands in adders' dens, safe around the wolves, the leopards, the lions, the bears. That's why I told the congregation this past Sunday, while preaching on the pictures of eternity in Revelation 21 and Isaiah 65, that in the new heavens and new earth, no one's ever gonna have to shoot a gorilla to protect a child. All of God's creatures will have a place, and there will be peace. I love Edward Hicks's Peaceable Kingdom paintings based on this passage. (There's a snippet of another one in the banner at the top of the blog.) For me it helps to see Isaiah's prophecy, to see the children there with the beasts. The kid's petting that jaguar. Here, in this world, that's not possible. In this world we need enclosures, with tranquilizers and guns at the ready, just in case. That's because we live in a broken world. But in the world to come, God's going to set things right. There, there's going to be peace. There, in the new heavens and new earth (Rev 21:1, Isa 65:17), this picture will come to life. In the meantime, we're called to seek first the kingdom of God (Matt 6:33), and we pray "thy kingdom come, thy will be done, on earth..." As Christians, working to see glimpses of God's kingdom here on earth is our mission, and visions of the kingdom like that in Isaiah 11 should inform that mission. 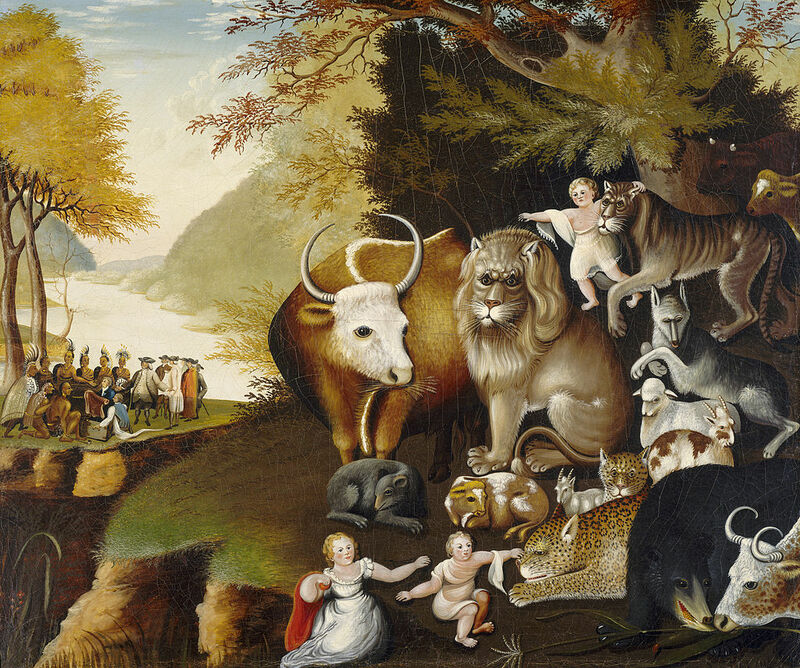 In The Bible and Ecology, during a discussion of the animals in Isaiah 11, Richard Bauckham (if you ask me, one of finest biblical scholars alive today) points out that "Biblical prophecy is not merely predictive but calls its readers to appropriate action now in light of the future it outlines. "* In other words, because we pray "thy kingdom come," when we hear a description of that kingdom, we need to get to work to see that picture come to life, "on earth." After we read Isaiah 11, we have to ask ourselves, "what can I do today that will help bring some of this peace to God's world?" Maybe that means volunteering with your local humane society. Maybe it means getting some of your groceries from a dairy where you know animals are treated well and have a high quality of life - check at your local farmers' market. Or maybe it means supporting gorilla conservation efforts (you can read about some of that work and how to give here). We're probably not used to thinking about it this way, but when you do that, you're seeking the kingdom of God. Even if you're not an 'animal person', or primates don't rock your world, we should all mourn the loss of Harambe, because his death reminds us that we're still stuck living in the middle of the mess, still waiting for redemption and freedom (see Rom 8:18-25). But in the meantime... in the meantime, let's seek the kingdom. Let's seek the peace and hope that God desires for the world - for us, and for our fellow-creatures. As I've shared before, this year I'm slowly working through a daily reader called Consuming Fire: The Inexorable Power of God's Love - it's adapted from sermons by the 19th century Scottish Christian author, George MacDonald. And I'm loving it. Let me share a recent passage with you. His talk about the second coming brings to mind the parable of the ten virgins in Matthew 25 and the parable of the man returning from a journey in Mark 13, not to mention the times Jesus said "about that day or hour, no one knows..." (Also, see 1 Thess 5:1-2!) Instead of ignoring Jesus and trying to guess the day or hour anyways, instead of end-times speculating, we should give ourselves to obedience and see what a difference that could make on this planet. In other words, instead of staring into the sun, looking for a glimpse of a kingdom Jesus assured us we won't see coming, why don't we put our money where our mouth is every time we repeat the Lord's Prayer and say "thy Kingdom come, thy will be done, on earth as it is in heaven"? Why don't we pursue obedience instead of speculations? (The one Jesus encouraged, the other he actually discouraged!) Maybe then we'd start to get glimpses of that Kingdom - only not off on the horizon but in our neighborhoods and prisons and nursing homes - as the Holy Spirit works in us and through us to transform hearts and lives and transform the world. "On earth," just like we always pray. 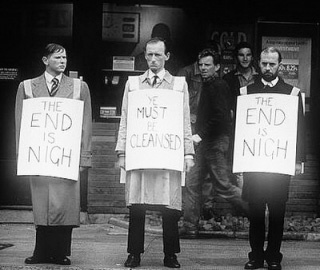 'Will the Son of Man find faith on earth?' If we take our Lord's Prayer seriously, if we take our obedience seriously, the answer can only be "yes." And what a difference would soon be seen in the world.